There are times when only a real belt of French nostalgia will do and Gy Resto — since February 5th in new digs — delivers on that front. Formerly found on rue Laval in a compact upstairs room, Gy has moved to rue St-Jacques in the space where Bistro St-Jacques used to be. 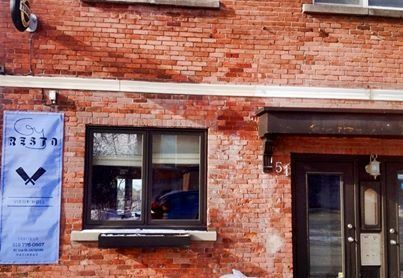 It’s a bigger home for the Gatineau restaurant, and a more visible one from the street. Upon entry, the first thing that grabs your attention is the pillar. It’s wrapped in chef’s whites — a collection of coats from all the kitchens Gyno Lefrançois used to work in, stapled down in a white jumble the length of the pole. The rest of the room is less cute: blue walls, yellow flowers, white napery, tiled floor, and an elevated patio that will seat 25 when it opens in early June. Gy’s opening gifts on our nights were tasty, seedy house buns the size of ping pong balls, a pot of hummus impaled with sweet potato crisps, a pile of cumin-studded poppadum, and neat triangles of a luscious game terrine. From there, it was a minefield of rich French food and we embraced it lustily, particularly the starters, which tended to please more than the mains. Beginning with foie gras, ordered for the promised asparagus ice cream, and a dish that ate better than it read. On toasted brioche (a bit soggy from too generous a puddle of demi glace) were poised two lovely lobes of liver, seared and rare, lightly fragrant of truffle oil, and with a thawing ball of the pale green ice cream. The deluge of sauce notwithstanding, I liked the cool of the glace and the hot of the liver, and how the two creamy elements worked so well together. 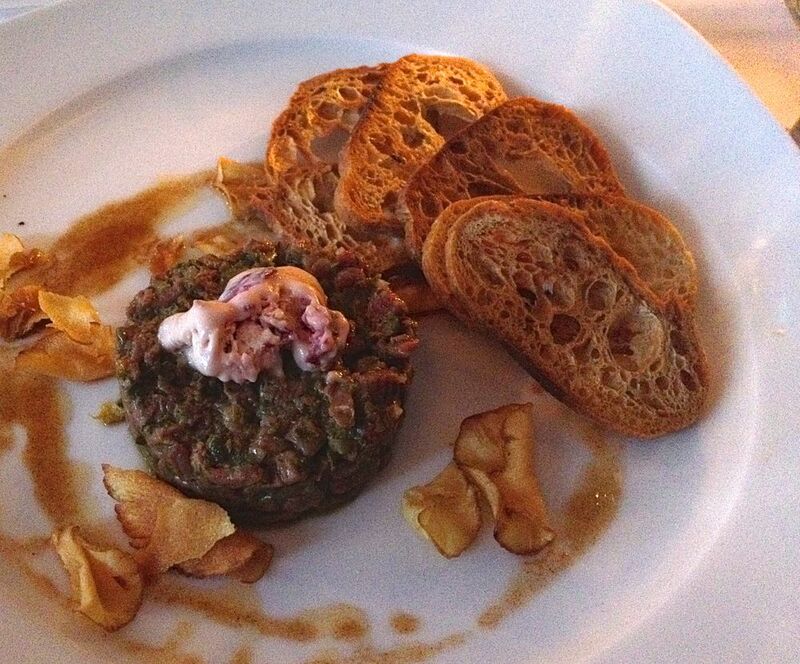 I was less convinced of the marriage of cranberry ice cream with a puck of steak tartare, though the tartare (served with toasties and sunchoke chips) was simply gorgeous. A trio of scallops came next, curry-stained and caramelized, plopped on a pillow of soft leeks with a thatch of fried leeks. 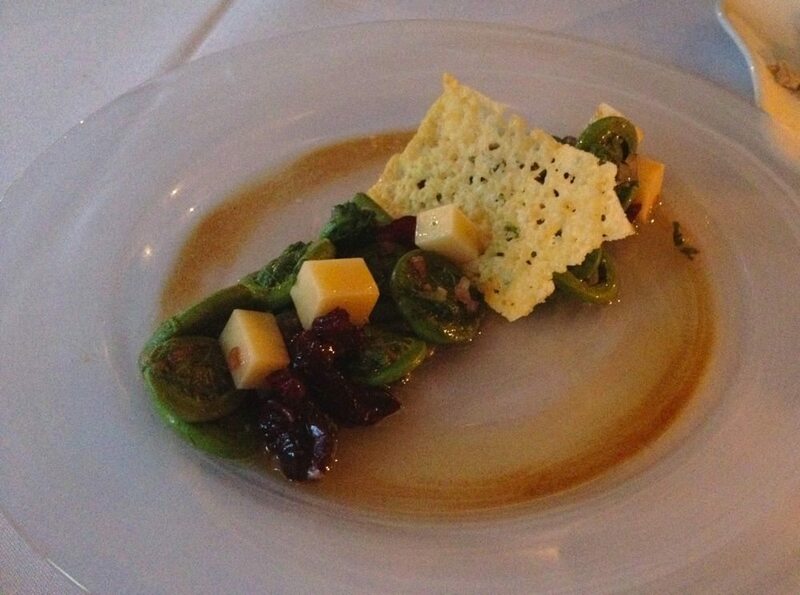 And then some green relief: tête de violon — the first of this year’s fiddleheads — steamed crisp and served as a cool salad ringed with a berry vinaigrette, and paired with the sharp, crunchy notes of a parmesan tuile. Emphasis on the main menu and on the chalkboard that rolls around the room is toward steak — beef, venison, bison — and the approach is French (well seasoned, the meat grilled to rare, covered in shallots, served with potatoes, and fussed over seasonal veg). The steak we stabbed into was well executed and came with an abundantly generous serving of roasted fingerlings. There were noodles both nights: ravioli of lobster, the pasta rolled thin and admirably delicate, the soft pink meat scented seductively with tarragon, and with fresh and snappy shrimp paddling about in a pink sauce. This dish might have secured top marks had there been a whole lot less salt in the sauce. One week later I’m still thirsty. Another night, cannelloni with the same impressive dough, but stuffed with shredded beef cheeks braised for hours and hours, and perfumed with coriander seed and a judicious amount of truffle oil — very rich (quite the theme of this place) and well executed. Main plates came with side plates of vegetables, a maçedoine of turnip, a wedge of roasted beet, a purée of parsnips, some julienned snap peas. Precious few non-meat choices on this menu. No doubt the kitchen could whip-up something, but vegetarians should probably head elsewhere. Sweeties included a chèvre cheesecake with strawberry coulis and a banana cake topped with a milk chocolate mousse sandwiched with a layer of dulce de leche. Both hit the spot. Service warmed a bit as the evenings progressed, but I did find Gy failed to meet the gracious service standard one would hope for in a fine French restaurant. Still, these are early days in a new home, and perhaps what I see as a certain aloofness is more an anxiety with a bigger space and numbers. Still, I think service has been an issue at Gy since day one, and I do hope the restaurant works on the welcoming factor, especially when so much else is going right.